Santa has a very busy schedule this weekend. He will be at the at Del Amo Fashion Center for photo opportunities until December 24. 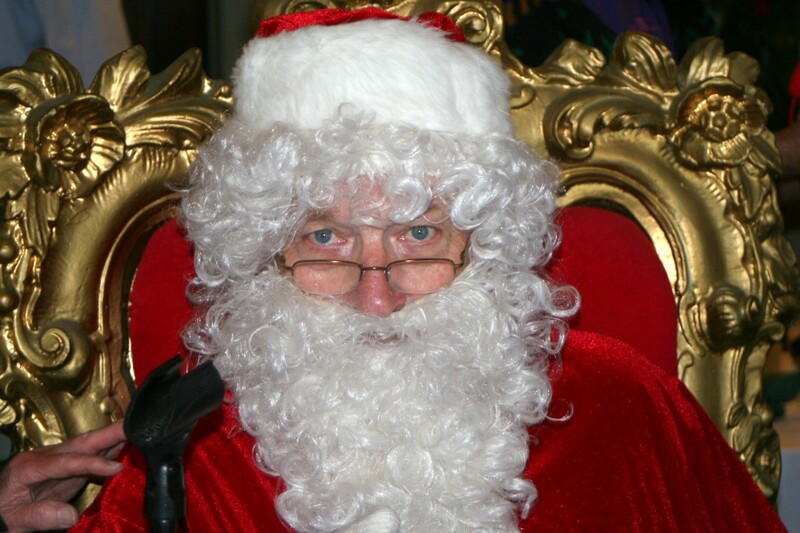 Tonight is the Holiday Stroll at Riviera Village Thursday from 5 – 9 p.m. Santa will be there! Then he will be at the Torrance Memorial Holiday Festival Fundraiser sharing hugs and spreading the holiday love. Don’t forget the Holiday Parade on Silver Spur Road and Deep Valley Drive, through the Promenade on the Peninsula to Norris Center from 6-7:30 pm. Yes, Santa is a busy guy this year. Children and families will be able to meet with Santa and take photos at Del Amo Fashion Center’s Santa set. Hours will vary by day. A full schedule can be found on the center’s website at simon.com/mall/del-amo-fashion-center. Del Amo Fashion Center, 3525 W. Carson St., Torrance. You can even eliminate the hassle of waiting in line with a FastPass. Get your FastPass at santasfastpass.com/scheduling/3jrs7l6Z:del-amo-fashion-center. The Riviera Village Holiday Stroll continues its tradition on the first Thursday after Thanksgiving. Hug that jolly guy in the red suit, Santa Claus, at the corner of Catalina Avenue and Avenue I. The Village takes on a cheerful holiday atmosphere with lights, decorations and festive music as revellers stroll along the avenues, which are closed to street traffic, admiring the festooned store fronts. 5 – 9 p.m. The holiday parade 6 p.m. 1799 S. Catalina Ave., Redondo Beach. Rivieravillage.net. The Sandpipers 26th Annual Holiday Homes Tour showcases four distinctive homes in the South Bay. Each home will be magnificently decorated and magically transformed for the holiday season. In addition, the Sandpipers Holiday Market featuring local artisans and restaurants provides a unique shopping and dining experience. Presale tickets $30, at the door $35. To purchase tickets visit sandpipers.org or call (310) 374-1748. Daily 10 a.m. – 5 p.m. Free Shuttle Transportation. Holiday Market Address: 2515 & 2521 Valley Drive, Hermosa Beach. Home location addresses will be provided on the ticket. Please email laraprotiva@gmail.com with any questions. For a complete list of tour activities and information visit sandpipers.org/hht. Cancer Support Community Redondo Beach (CSCRB) hosts Howard Sandler, MD. Participants will learn how clinical trials are structured, and how to foster an open dialogue with their health care team about the eligibility and the viability of clinical trials as a treatment option. The importance of shared decision making and resources to help facilitate these conversations will be discussed. 1 – 2:30 p.m. 109 West Torrance Blvd., Redondo Beach. A nutritious lunch will be provided by The Spot Restaurant in Hermosa Beach from 12:30 – 1 p.m. Advance registration required. Call (310) 376-3550 or visit the website at cancersupportredondobeach.org. Start your Holiday season with the 30th annual production of “The Nutcracker”, presented by Peninsula School of Performing Arts. A beautiful blend of professionals, pre-professionals, adults and young dancers come together to delight audiences of all ages with this rich rendition of the classical ballet. 7 p.m. Adult tickets $35. Children 10 and under $25. Purchase tickets at app.arts-people.com/index.php?show=93517 or call (310 544-0403 x221. Categories include children’s, teen’s, art, cooking, history, biography, garden, decorating, craft, self-help, science, travel, classic as well as text books. Prices start at 50 cents with most priced at $1. Proceeds pay for the programs at the library offered for all ages. 10 a.m. – 3 p.m. Manhattan Beach Library, 1320 Highland Ave., Manhattan Beach. Questions call (424) 241-0532 or email MBFOL90266@GMAIL.com. Torrance Public Library and Arts Council of Torrance present a special event featuring speakers and a film presentation honoring Aiko Herzig Yoshinaga. Prisoner. Housewife. History detective. Hero. 1:30 – 4:30 p.m. Katy Geissert Civic Center Library, 3301 Torrance Blvd., Torrance. Call (310) 618-5959 or visit Library.TorranceCa.gov. Torrance Memorial Medical Center’s 35th annual Holiday Festival fundraiser. More than 36 themed, decorated trees, live entertainment, the South Bay’s largest holiday boutique, opportunity drawing, children’s activities and food court. $5 general admission. 10 a.m. – 9 p.m., and Sunday, Dec. 2, 10 a.m. – 4 p.m. Torrance Memorial Medical Center, 3330 Lomita Blvd., Torrance. Call (310) 517-4606 or visit TorranceMemorial.org/holidayfestival for more information. Music Director Dr. Berkeley Price and Associate Director Mr. Justin Raines will lead the band in a concert of “Music that Inspires and Excites.” Selections will include Greensleeves, A Christmas Festival, Farandole, How the Grinch Stole Christmas, and On With the Snow. Special guests will be the award winning Sunday Night Singers, under the direction of Maestro Michael McCullough. 3 p.m. Salvation Army Chapel, 4223 Emerald St., Torrance. Admission is $10 for adults, and children 12 and under are free with an adult. Tickets are available at the door or online at pswinds.org. The 11th Annual Christmas Holiday Open House and Walk About presented by the North Manhattan Beach Businesses. The streets will be bustling with shoppers, restaurants will be serving their original menus and many merchants will be offering unique gifts, discounts, samples. Christmas DJ, Cotton Candy, Popcorn, and bounce house at 35th Street. Santa and his float will be flying in from the North Pole and landing at the Miracle of 34th Street! 5 – 9 p.m. 33rd to 40th/Highland Ave., Manhattan Beach. For more info visit northmb.info. The 21st Annual Palos Verdes Peninsula Holiday Parade of Lights. With a special visit from Santa Claus! The parade travels along Silver Spur Road and Deep Valley Drive, through the Promenade on the Peninsula to Norris Center Drive. 6 – 7:30 p.m. Free parking. Hermosa Beach Holiday celebration Open House, Charity concert and Holiday Tree Lighting. The festivities begin at 3 p.m. with a charity concert with Jeremy Buck and The Bang, XYZPDQ, Jamisen Jarvis and V Torres. Tree Lighting at 6 p.m. Donate a Toy. Bring an new unwrapped toy benefiting the Beach Cities Toy Drive. Downtown Hermosa Beach, Pier Plaza. Church of the Beach Cities is proud to welcome back Kevin Click. Kevin is a seasoned singer/songwriter who has spent many years performing professionally as well as leading Worship in Churches across the map. 9:30 a.m. & 11 a.m. Free. Parking and Child Care Available. Church of the Beach Cities, 859 Main St., El Segundo. For more information visit churchofthebeachcities.com.